Prince William has already proven in the past that he can photobomb with the best of 'em. (Need I remind you of that time the prince bombed a photo with Olympic cyclist Chris Hoy back in 2014?) And now, the Duke of Cambridge has solidified his status as an Official Royal Photobomber once more. 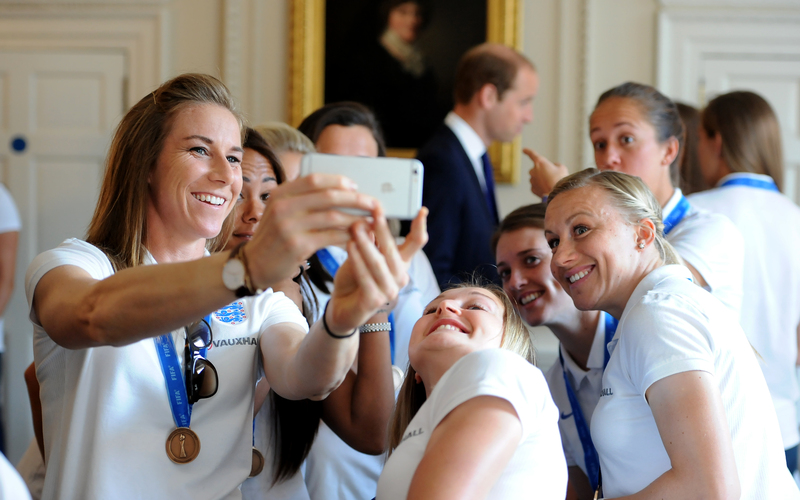 Prince William photobombed the entire English Women's Soccer Team at a breakfast reception at Kensington Palace in London. Needless to say, it was all sorts of awesome. As these ladies probably know, the royal family has made quite a name for itself by jumping into otherwise innocuous pictures — and instantly making them amazing. Let's take a look back at some of the most memorable ones below. Is it really any surprise that Prince Harry would do an intentional photobomb? The notorious jokester decided to sneak into a picture with New Zealand officials at last year's Commonwealth Games, and it was equal parts hilarious and, well, hot. Harry, who was seated just a couple rows behind the officials, let his goofball flag fly proudly, by putting two thumbs up and grinning like crazy. Prince Charles found himself in a bit of an unexpected predicament during an on-camera interview last March. This time, he wasn't the photobomber — his adorable grandson was. It all happened while the prince was discussing the importance of Earth Hour, which involves shutting off all non-essential lighting in your home for one hour as a statement of intent to protect the planet. There was only one problem: a framed family photo of Prince George was next to Prince Charles during the interview, which understandably distracted many viewers from basically listening to anything Charles was saying. But really, who can blame them? Prince George's overwhelming cuteness is highly distracting. Who would've known the Duchess of Cambridge had it in her? Last year, Kate expertly pulled off a surprise photo appearance in a young fan's selfie while she was visiting Christchurch, New Zealand. And man, was it awesome. Just imagine how psyched the guy was when he saw the royal doing that high-five/fist-bump combo right behind him!